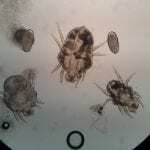 These little mites, which are just visible to the human eye, are also known as Cheyletiella. They are usually very itchy and produce a lot of dandruff from the irritated skin, hence the name. They are highly contagious and affect cats, dogs and rabbits. We can test for them very easily by taking a sticky tape impression from the animal’s skin and looking at it under the microscope. In rabbits they produce a thick dandruff and scale particularly on the back between the shoulder blades. They can bite humans too but can’t live on us so when they are killed on your pet (and they are usually fairly easy for us to eliminate) any itchy spots on you should go too! We will often take ear swabs to be sent to an external laboratory to be cultured and give us an idea of what antibiotic to use. 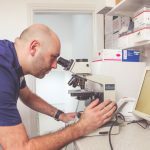 However, we can get a lot of information from doing an ‘in house’ swab which we stain and look at giving you the results on the same day. 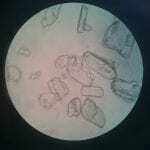 This will give us an idea of if there are any ear mites, yeasts and different types of bacteria in the ear. This in turn gives us an idea what is the best ear drop to use and more importantly what type of ear cleaner to use. There are many different types of ear cleaner (as you’ve probably noticed) and they all do different things. Some just clean the ear but others can help destroy bacteria or yeasts. If we swab your pets ear we can phone you later the same day to advise what is the best type of drop and cleaner to use. 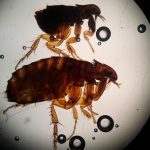 Much has been written about fleas, but they do make good photos! Click here to read more on flea control at Withy Grove. 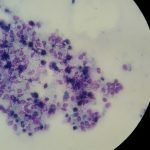 Animals will sometimes produce crystals in the urine which cause cystitis from irritation as well as being able to ‘grow’ into bladder stones. We can identify what type they are (these ones are called struvite) and this gives us an idea of how to both prevent and treat them.